SeaCure Moving is a family owned business providing reliable and affordable moving serving as preferred New Jersey Residential Movers. For over 30 years SeaCure Moving has taken pride in the services and professionalism that we bring to the industry. With having moved thousands of residents to and from New Jersey our reputation has been built on creating successful moving experiences for our customers. At SeaCure Moving, we believe that going the extra mile is important at every stage in the moving process. We have been in business moving families since 1981, and have become a BBB-accredited business and a ProMover member of the American Moving & Storage Association (AMSA) for over three decades of putting our customers and their needs first. 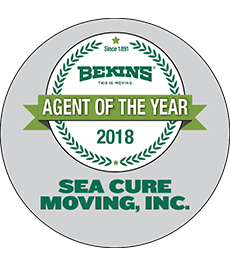 As an agent of Bekins Van Lines and the preferred New Jersey Residential Movers, no residential move is beyond our capabilities. Collaboration is important to us at SeaCure. We will work with you to customize your move to meet your exact needs, no matter if you’re moving your home across the town, country or internationally. Being dedicated New Jersey Residential Movers we are committed to simplifying your moving experience from start-to-finish. You will work closely with your move coordinator throughout the entire moving process – ensuring that your belongings are safe and secure while arriving at your destination on time and accounted for. Local Movers: Your move may not be far away, but it can still be challenging! Our full-service local moving services will ease your local move every step of the way. Long Distance Movers: Moving across the country is a simple matter with the capabilities of SeaCure Moving. Interstate Movers: As a Bekins interstate agent, we have a comprehensive network of support that extends around the country. Senior Moving: We can move you or a loved one seamlessly to the apartment, condo, or assisted living facility of your choice. If you’re looking for New Jersey Residential Movers or just want some information, contact us or fill out our quote form for a free moving quote today! Recently moved from NJ to Florida. The move by SeaCure was flawless. The crew that loaded the truck in NJ & the crew that unloaded in Florida were great to work with. Sandy, the driver, made sure that everything was packed & loaded properly. Would highly recommend this company for any move. © 2012 - 2019. All Rights Reserved. SeaCure Moving. All images used are property of SeaCure Moving.